The Dutch Slavist, journalist, and writer Marente de Moor was born in 1972 in The Hague. 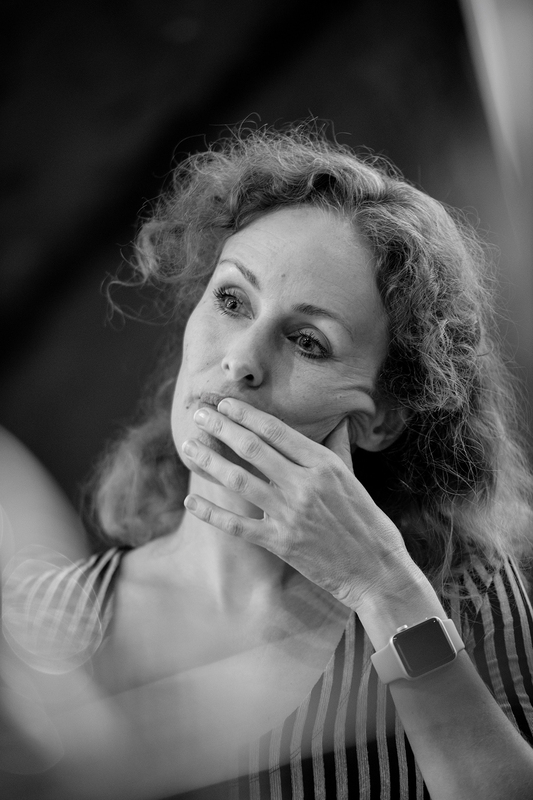 In the 1990s, she lived in Russia, where she studied theater and wrote for »De Groene Amsterdammer« as a correspondent. Her columns about everyday life in Russia were published in a book titled »Petersburgse vertellingen« (1999; tr. Petersburg Stories). After her return to the Netherlands, she worked for the weekly magazine »HP/De Tijd«. In 2007, she débuted with her novel »De overtreder« (tr. The Transgressor): After the fall of the Soviet Union, at the beginning of the 1990s, a motley group of Russians make it to Amsterdam, where they sell watercolors to tourists at Rembrandtplein by day and study the art of drinking vodka at night. One of them is Vitali Kirillov, who can no longer risk even riding public transportation without a ticket as his visa has expired. But Vitali has even more to answer for: Eight years prior, as an officer at the Soviet-Finnish border, he allowed a comrade to flee to the West, which earned him the nickname »big hole in the Iron Curtain« and a harsh punishment from the army. Supported by the resolute Jessie, he now wants to find out what happened to his refugee comrade. In the novel, the city of Amsterdam and its different districts come to life, and the city’s Russian scene is impressively portrayed with raucous characters and hedonists who have lost their homeland and must find new identities. In 2010, de Moor published her second novel, »De Nederlandse maagd« (Eng. »The Dutch Maiden«, 2017): In the summer of 1936, Janna, a young fencer from Maastricht, seeks out her father Jacq’s old friend in Aachen in order to train with him. She lands in the unusual world of Egon von Bötticher, a true master of his art who, after having been wounded in World War I, is now bitter. Her initial aversion soon changes to infatuation, as she tries to find out what secret connects him to her father. She finds answers in Jacq’s letters to Egon. Little by little, the outside world trickles into the estate until the novel’s dramatic resolution. The novel, which walks »with a waving flag, a drawn sword, and reasonable stylistic confidence along the fine line between Ernst Jünger and Leo Tolstoy« (»FAZ«), won the prestigious Dutch AKO Literatuurprijs in 2011 and the European Union Prize for Literature in 2013. De Moor recently published the story collection »Gezellige verhalen« (2015; tr. Cozy Stories), which won the J.M.A. Biesheuvelprijs. The author lives in Limburg.